Butterflies Begin Work on Made In Hull Exhibition. On February 22nd the Hull-based charity Butterflies Memory Loss Support Group will present the ‘Hull, We Made It, We Did! !’ exhibition at Kardomah 94 as part of the Made In Hull Season for UK City of Culture 2017. Preparation has already begun with workshops led by Lead Artist Frances Kelly delivering art workshops exploring themes of working lives and the workplace in the local surroundings. In the first session the group participants and their carers were introduced to the project and how it was part of City of Culture. Some of the participants are very aware of the Hull 2017 mega-event and have visited the some of the attractions. This regular Thursday group are just like a bunch of friends; they interact with each other with ease and familiarity. They talk amongst each other happily tucking into a hearty chicken soup made in the kitchen on the premises. The meals for the group are sourced via generous food donations to the charity. The first art-making session led by Frances Kelly with support from staff and Butterflies volunteers, invites group members to use their creative skills to draw paint and colour iconic figures from Hull’s history, such as William Wilberforce and Amy Johnson and a number of iconic locations such as the River Hull and Hessle Road. Using light boxes to help with the tracing of the images each participant makes their own decision as to which image they wish to recreate. Discussion about all the different characters and places runs freely around the table with each image provoking memories and discussions about working in Hull. A picture of Rayners pub has participant Ray reminiscing about his years working in the Pub Trade, recalling the names of the pubs he used to manage and some of the stringent rules around absentee landlords applied by the breweries. He happily regales anyone within earshot with some tunes he used to sing during these times. Another group member Iris has brought in some small prints of her husband who was a sign writer on the buses. Using a gadget the images are enlarged so they can be used in a picture for the exhibition. Iris is clearly very proud of the work her late-husband is doing in the pictures, explaining how he had to take care standing on his ladders. The technology of the light boxes holds no worries for the group, they all appear quite happy using them. Resident photographer Cyril takes it upon himself to document the project taking photographs of the group busily working. He himself has chosen an issue-led response to the city focusing on the struggle of the homeless community. Where many may have been going out to work and spending time with family Cyril was facing life on the streets, so his response to this project is perfectly apt and poignant. On another table poet Stevie Smith is being given a makeover with bold, bright colours on cotton. 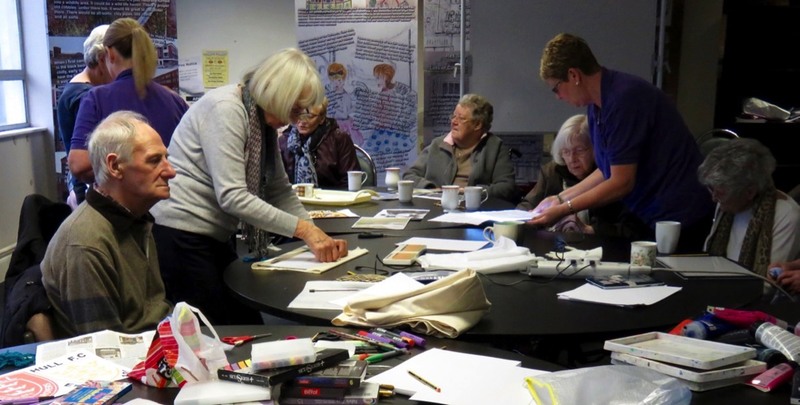 With carers and cared for all joining in there is an industrious buzz in the room as the butterflies group are busily engaged in the process of preparing work for the exhibition. The work produced for the Hull, We Made It, We Did exhibition will be a celebration of what the group can achieve. The location of the exhibition downstairs in Kardomah 94 is a public space and means many people visiting the venue will see the exhibition. This opportunity for the work to be seen is so very important to the group. Having the work on public view gives the participants a sense of purpose. Friends, family and members of the public will see that despite the difficulties associated with their various memory loss conditions, they can still lead productive and stimulating lives.